I vowed when I gave up smoking that I would never become an ugly non smoker and that I would always remain a tolerant ex smoker. However, this has not been the case. We have a friend who is the most selfish smoker I have ever met. One night when we were at a restaurant the owner delayed each and every one of the courses as she kept getting up to smoke. Her husband was cross with the restaurant but I totally got where they were coming from as the food needed to be served hot, and we were a table of 12! Another night she got into the car with 3 of us who are non smokers and she lit up. I opened the window even though it was a bitterly cold evening and she told me I was pathetic for being affected by the smoke. I have had a few really bad bouts of bronchitis and the smoke from cigarettes and fires is intolerable as it affects my lungs. She further made her smoking uncomfortable for a group of us when she insisted on smoking in someone else’s apartment and I kept on walking away from where she was and she kept on following me. But this still did not make me cross until we went away! We were told that we could not smoke indoors and if anyone did, the barge would be stripped, cleaned and refitted, at our expense. As Dave had paid for the barge on his credit card this literally would have been at our expense, and not at hers! She lit up one night and as she was not actually smoking the cigarette told me she was not smoking inside. Being pedantic of course she was right, but it was still a smoking cigarette! And then she did it again after I asked her not to smoke, and she said they would never know as they could not see her! #FFS that very instant turned me into that non smoker. I explained the cost implication of her actions and she could not care less! It totally got to me as I was never an inconsiderate smoker. And I tolerate considerate smokers but I will not tolerate her smoking ever again. 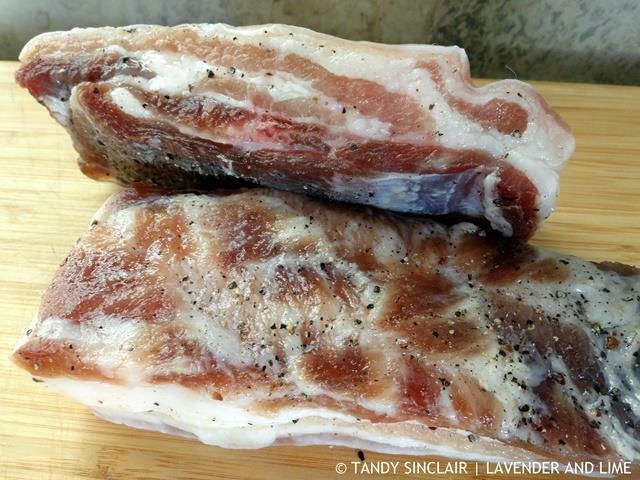 Thankfully, I did not need to light a smoker to make Home Cured Pork Belly (bacon) at home. Whereas pork can be smoked, curing it is more traditional and the Wiltshire cure appears to be the oldest known recipe for bacon. I have used some of those ingredients, together with Peter Goffe-Wood’s recipe for Home Cured Bacon that I downloaded from Mastering Meat 2 as inspiration. I have used celery seeds instead of saltpetre as they are a great source of natural nitrates. Disclosure: Yuppiechef.com own the copyright to Pete’s recipe and it has been used with their permission. This post is in line with my blogging policy. I am on leave until the 8th of January. I will start replying to blog comments then. I wish you all a safe festive season. i hope you got rid of this so-called “friend” tandy. not a friend at all by the sound of it. merry xmas to you and yours. Looking forward to giving this a go as I tried a different method once in the past but had to chuck the meat away as it was way too salty! That would have made me so mad! Ugh – I can’t stand smokers like that! It’s so rude. 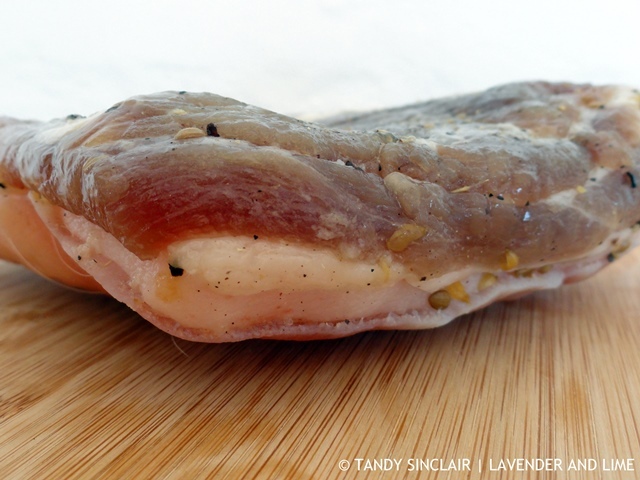 This home-cured pork belly sounds terrific! Kudos to you for making it yourself! I’m with you on home made cured meat as you get to control what you put into. This may be just in time for the holidays!! Wow this is so classy, I didn’t know you could cure your own pork at home! I recently quit smoking, and I know what you mean. Lighting up does not being inconsiderate. Love that pork belly. Have a great blogging break. You’ve been busy throughout the year. Will look forward to your being back. I am actually highly intolerant of smokers, but this woman sounds like THE WORST. Probably not worth being friends with anymore if she is so inconsiderate of you!! Your use of caps is perfect here Joanne! She is the worst smoker I have ever come across. cool! I’ve never did that before! You inspired me to give it a try! Very cool post. I am going to try this one day! Mmmm – delicious Tandy – must give this a try – thanks Tandy. Hi Tandy, wow! I don’t think I have ever met anyone like the person you have described above. Unbelievable! Anyway, my husband would love this cured pork belly. Wow she sounds terrible! I can’t abide smoke at all. It makes me very ill and I just couldn’t put up with it. This pork belly looks great. I so enjoyed making bacon this year! Yikes that does not sound like a friend! On a happier note, this pork belly looks SO good! I’ve never made pork belly in the home, but I’m seriously inspired.